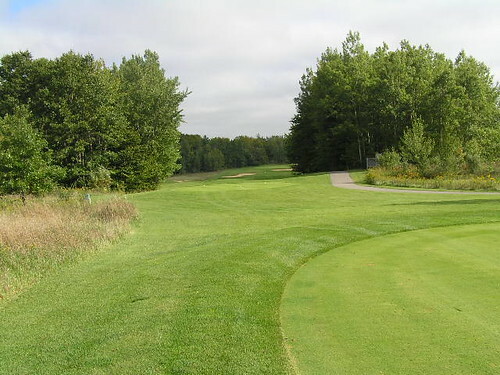 I love The Heathlands golf course in Onekama, Michigan. There really isn’t another way to put it. When you combine the cost, terrain, views, and difficulty, it is easily one of the best courses I’ve ever played. It is one of those undiscovered treasures that seem to go unnoticed. 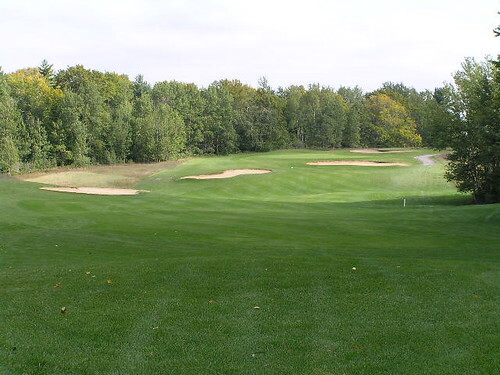 It’s only about 10-15 minutes south of Arcadia Bluffs, and a half hour north of Manistee National, so if you’re ever in the area (Northwest Michigan) have a look for yourself. 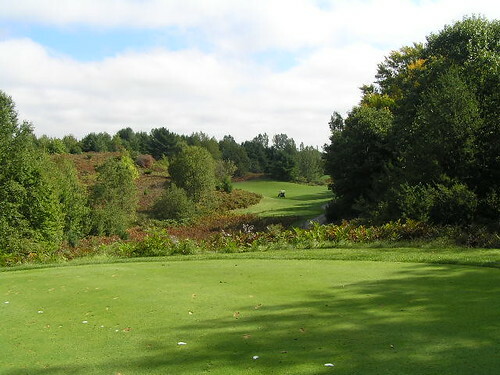 The Heathlands isn’t a long course (6569 from the Blacks), but what it loses in length, it gains in elevation changes and difficulty (Rating/Slope = 72.3/139). The first hole is easy enough (I’m a fan of easy, warm-up first holes.) It’s a par 4, measuring 401 from the tips. 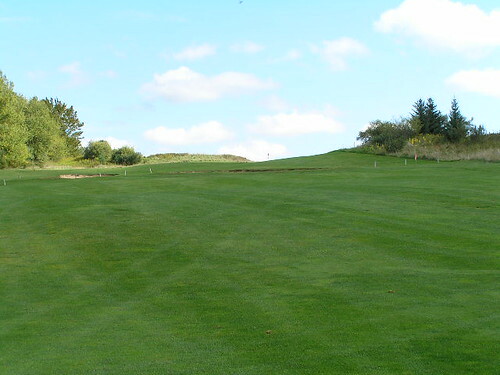 The tee shot should hug the left side, giving you a good angle to the long green. 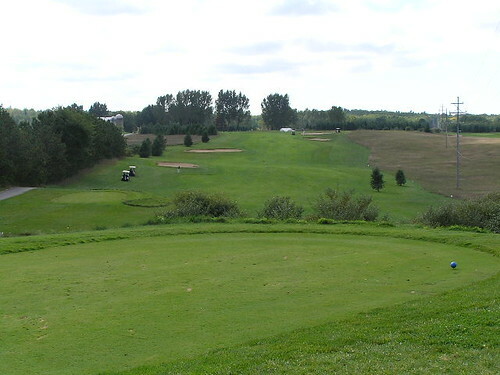 The second is a straight-forward par 3, but on the third, the fun really starts. It’s a 559 yard par 5 that is almost reachable, if you cut enough of the corner. 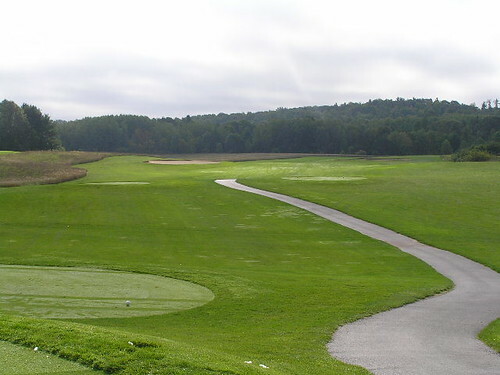 The tee shot looks like you should aim straight, but before you hit, take the cart just past the women’s tee, and see how far to the right you can hit your ball. 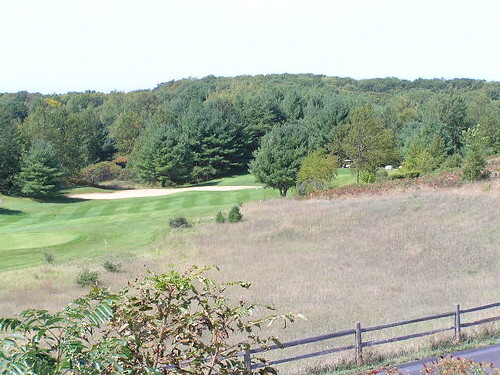 You’ll probably be aiming over the trap and bush on the right-side of the tee. The fairway is fat, so swing away. The green is very tight (which forces me to make it a 3-shotter), with bunkers in the front, and OB behind it. On 4, the tee shot is all about placement. 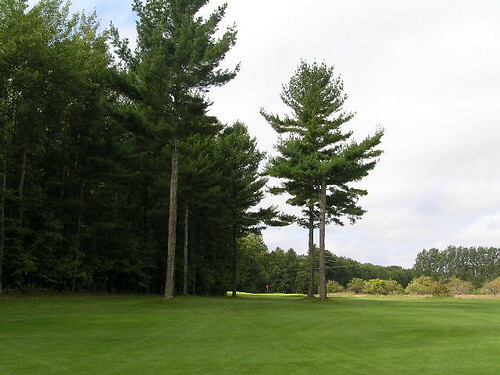 Do what you can to reach the flat area of the fairway but be warned; a driver may be too much. If you leave it on the hill, you may have an approach that looks like this. 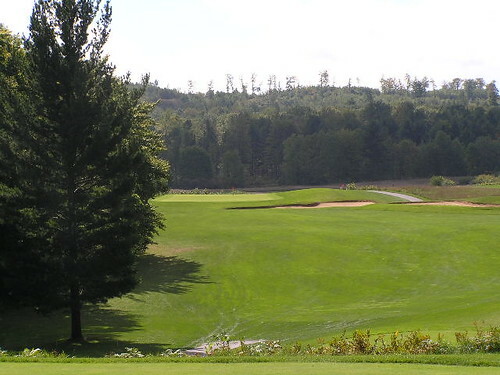 The fifth is a 445 yard par 4, which is the #2 handicap hole on the course. Driver for sure here, and stay up the left-side to catch the downslope, but don’t land in the left bunker. Your approach (which is almost blind) can be a bit long if needed, because this green is HUGE. It’s two-tiered, but it’s better (for me anyway) to be long here than short, and in the bunker guarding the front of the green. 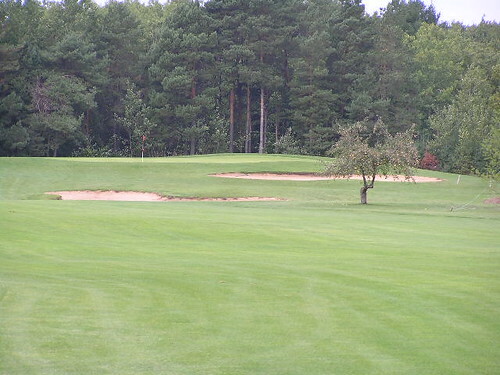 The 6th is a par 5, but with a hammer for a tee shot, is reachable. Like the third hole, the green is really guarded, with a bunker in front and OB behind it, but don’t let that scare you. 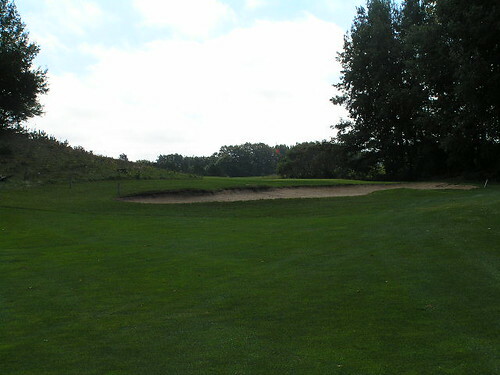 The 7th is another fun hole that is a severe dog leg to the right. 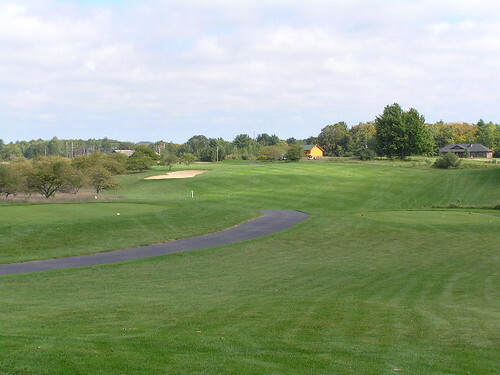 Seasoned players (of this course) may go for the green by cutting the corner and hitting a huge cut, but for the rest of us, hit a 200-220 yard shot into the middle of the landing area. This should leave you around 100 to the green, which is uphill. Oh yeah, and you’ll be landing it blind (especially if the pin is in the back), so hit a crisp one here. Fifteen is THE hole. 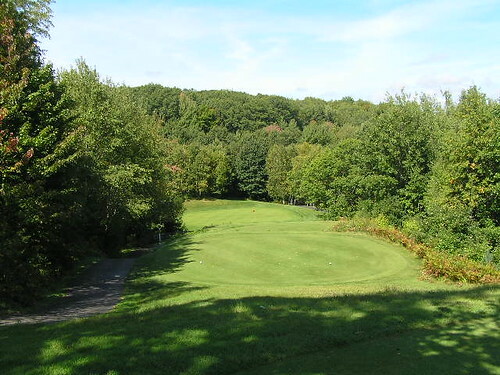 It’s a downhill par 3, that is easily one of the most scenic holes in the area. 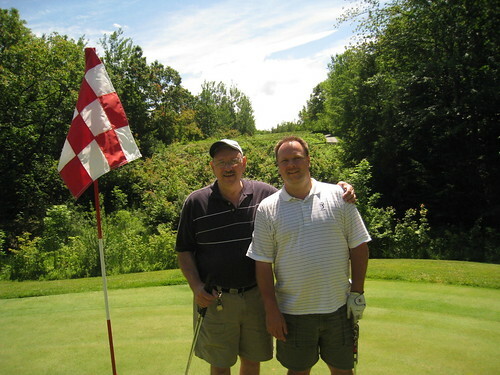 (The first picture in this set of my Dad and I was taken on this green.) It’s so far downhill that it’s easily a 2-3 club difference, depending on wind. It’s so dramatic of a shot that you should be happy if you keep it on the green, let alone near the pin. Bring your camera for this one; it’s the best. The 16th isn’t a long par 4 (360) but it is ALL uphill. Driver is probably fine, but your approach is also uphill, so be sure to adjust for it. Here are a couple pictures of the tee shot, and the approach. The 18th is an animal; there’s just no other way to say it. It’s the #1 handicap hole on the course, and for good reason. It’s 605 yards from the tips, and absolutely impossible to go for in two, so don’t even think about it. The tee shot is wide open, so go ahead and let it fly. The second shot should leave you with about 150 in (the water is at about 140 or so, so be sure not to go long on this shot.) Because it will be an uphill, blind shot, you should take a little more club, but don’t take too much, or you’ll be wet. 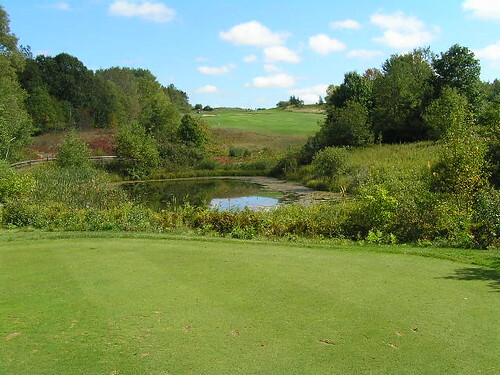 This usually causes players to play safe, which leaves them about 160-170 for their third shot (over water). The green is very large, with multiple undulations. 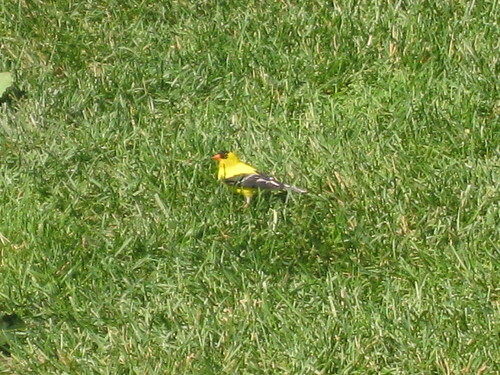 Although I’m sure it’s happened, in the dozens of times I’ve played here, I’ve never seen anyone birdie the 18th. A par is quite an accomplishment here! As I said, I really love this course. It’s short enough that my Dad doesn’t feel intimidated, it’s scenic enough that my wife loves playing here, and it’s challenging enough to keep me coming back. Plus, it’s as reasonable as it gets (In-season weekend is $65). Now you see why we’re smiling so much!